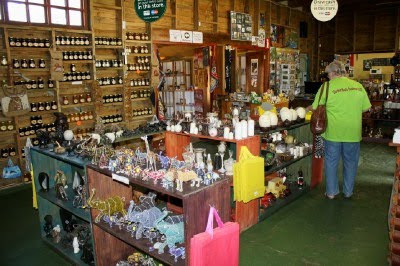 ... while the shop sells everything from beaded curios to home made jams. Dewald is also involved in a local community project with ladies from the surrounding area doing embroidery. Their products are sold through a number of outlets which includes the shop. 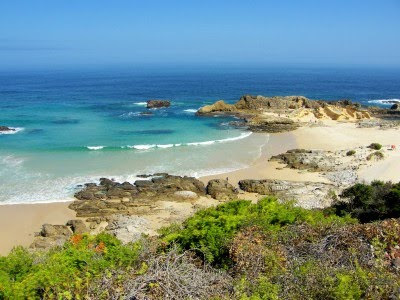 So next time you travel down the Garden Route, why not take the Eersteriver / Kareedow turnoff and visit Oudebosch. 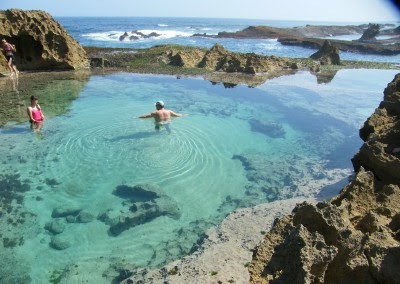 You associate the Tsitsikamma with indigenous forests, deep gorges, a rugged coastline and heart stopping adventures. 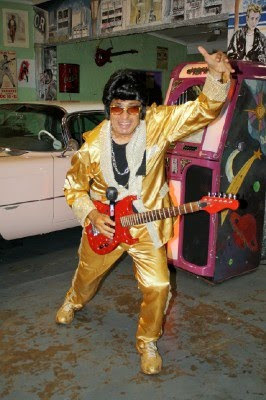 Just about everything but Elvis. 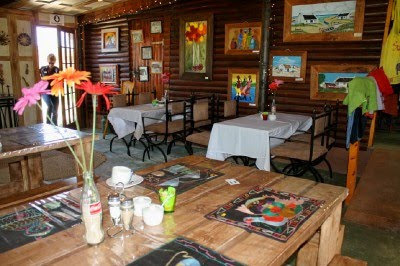 From 30 April to 2 May 2010 the Protea Hotel Tsitsikamma Village in Storms River on the Garden Route will be hosting the first The Elvis Festival Africa. 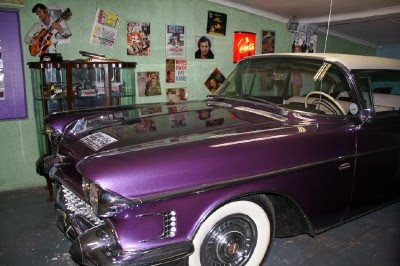 Owners Jan and Ann du Rand are huge Elvis fans and also proud owners of the Cadillac Shack next door to the hotel. Most of the activities during the festival will take place around the hotel and the Cadi Shack with its big collection of Cadillacs. 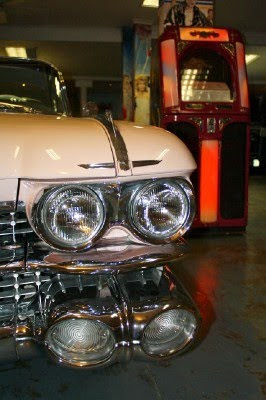 The program will include six Elvis Tribute Artists shows and two Marilyn shows, a Miss Marilyn beauty pageant, a teddy bear hunt, Elvis era classic car show and much much more. When we were small we used to find chameleons in the garden all the time, but that was then and this is now. These days I don't get to see them anywhere as much as I would like to, so it was a big surprise to find this little guy on the stoep of the Protea Hotel Tsitsikamma Village in Storms River the other day. I was really scared that somebody would step on him, so I picked him up and moved him to the garden. 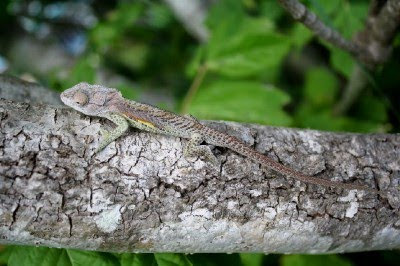 According to The Wildlife of Southern Africa, my nature bible, it is a Knysna Dwarf Chameleon (Bradypodion damaranum). I've been away for a week and has also just about run out of bandwidth for the month, so if you haven't heard from me for a while, don't worry. I'll be back commenting by Thursday. 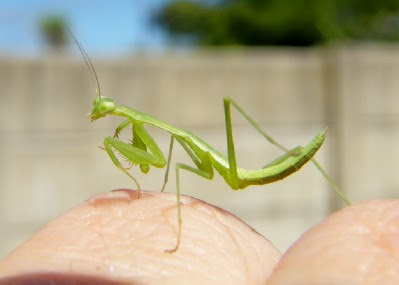 The other day while working in the garden I found this tiny little (baby) praying mantis. Here he is sitting on the knuckles of my fingers. The mantis is a predator of other insects. The females chews off the head of the male during mating (I am so glad I'm not a mantis) and than lay her eggs in a frothy egg case from which the young hatch. 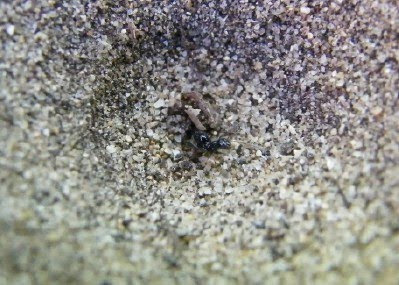 The young looks like big ants with a large up curving abdomen. 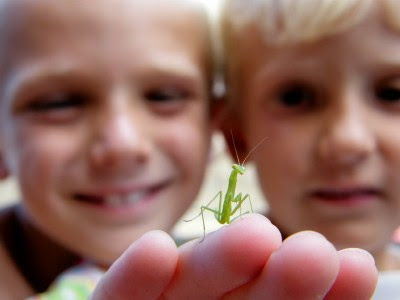 There are four families of mantis. The Rugrats are normally very skittish of any bug or the like with Drama Princess more likely to hold it in her hand than Chaos Boy. The thing that interested Chaos Boy most though is that the praying mantis is one of the monsters featured in the animated series of Bakugan. 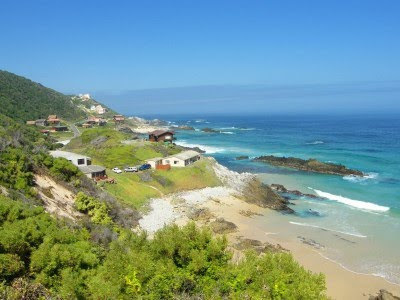 I am currently on the Garden Route on a business trip (with a borrowed camera in hand as mine is still in for repairs) so I am hoping to get some opportunities to take a couple of nice pics of the area to post in the near future. 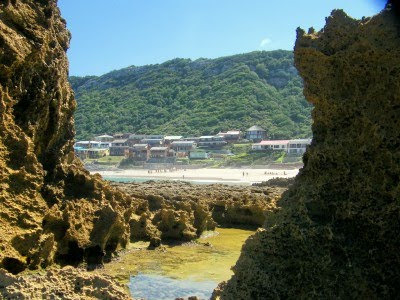 The rocks at Eersterivier form a lot of interesting little coves and other features. This gully runs along the western side of the village and had lots of kids in it at low tide trying to catch fish with their nets. Next to is was the most amazing deep gully where we swam for most of the day. In between the rocks we found this stunning spot to swim. At its deepest it takes you just below the shoulders. The only problem is that you shouldn't try entering the hole without shoes on because of the sea urchins. 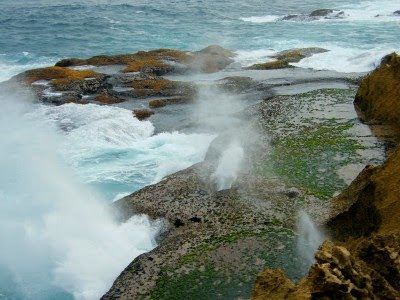 Blow holes are always an interesting feature along the coast. There were three holes all together and every time the waves hit the rocks and causes the water to be forced up through the holes. 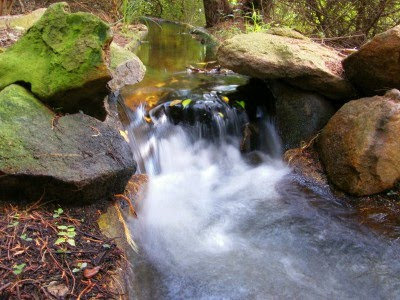 One of the features of Eersterivier is the ancient sandstone rocks along the sore. They used to be dunes many moons ago but time and other factors (just don't ask me which ones) have hardened them to what they are today. The rocks are very sensitive and visitors to the area are asked not to climb on the or break off pieces. 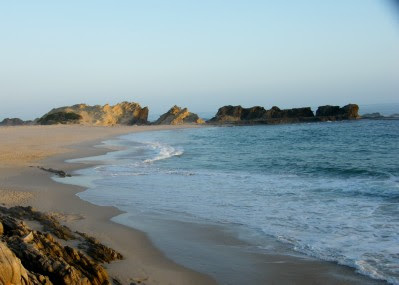 A view down to the small bay on the left hand side of the village where the sand stone rocks start. I followed a path to the top of the rocks and on the sea side are quite a few interesting features, amongst others a small arch through which the waves were breaking. Unfortunately my camera conked in before I could go beck there the next day when the sun was shining. 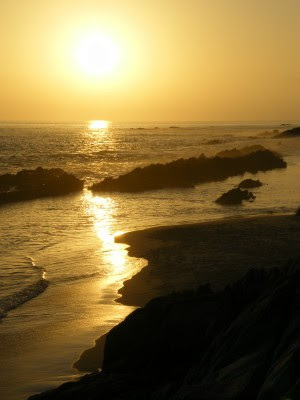 Visit the great people at Skywatch to see some more picture that feature the sky. 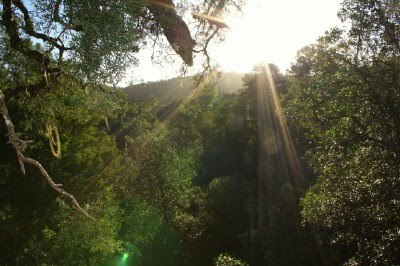 A week or so ago we spent a weekend at Eersterivier in the Tsitsikamma. 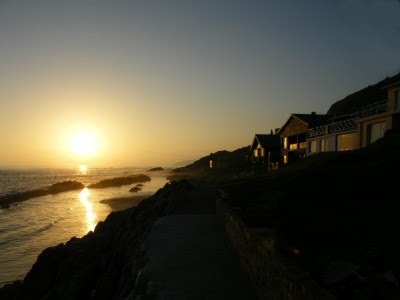 I hesitate to call it a village as it is nothing more than two rows of houses wedged between the beach in front and the hill behind. 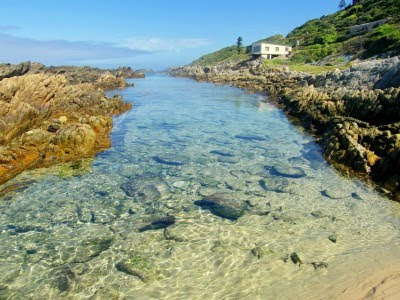 Eersterivier (picture above) and Skuitbaai (in the background of the picture below)next door has less than 100 plots each to avoid it being classified as a village. 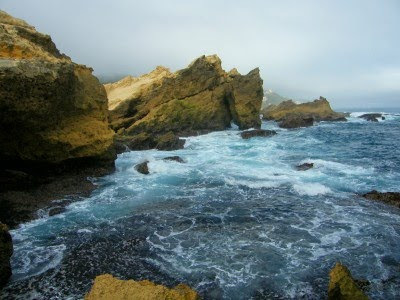 The weekend's weather was gorgeous, the water turquoise (but for some reason freezing cold) and the place stunningly beautiful. 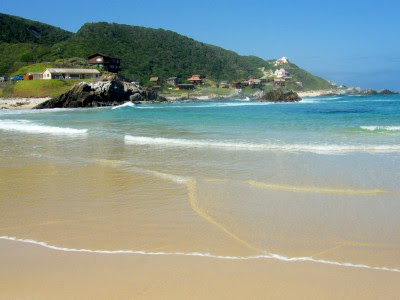 The beach is also spotless. Its a gated area which means that you will only find residents (either owners or people renting houses for the weekend) on the beach. Thus no crowds. 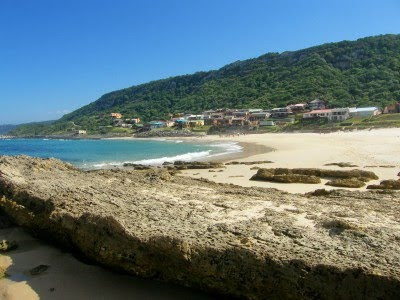 A major feature of Eersterivier is the sandstone rocks and ancient sandstone dunes in front of the village. The sandstone is very sensitive and visitors are asked not to climb on them unnecessarily or to break them at all. My mom grew up in the Langkloof on the other side of the mountains from the Tsitsikamma and she was telling us how they visited Eersterivier on weekends. In those days there were just a handful of houses, most of them nothing more than shacks. 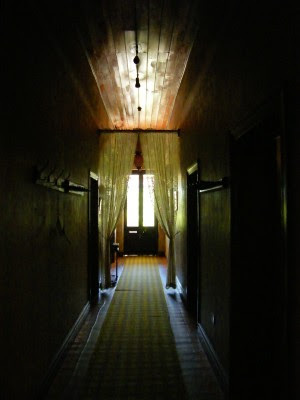 Today most of the houses has been extended and rebuilt, but there are still some of the original structures around. 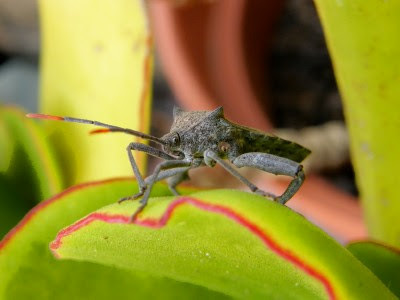 I found this unusual bug on one of my succulents by the pool the other day. As usual I ran to get my camera and got a couple of pics. 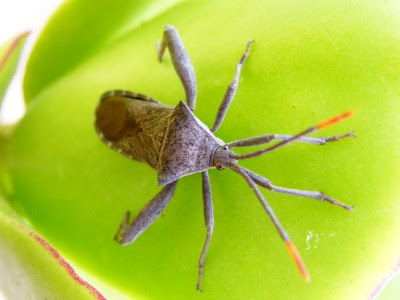 Referring to my Wildlife of Southern Africa book, I found out that it is a Twig Wilter Bug (Family Coreidae). 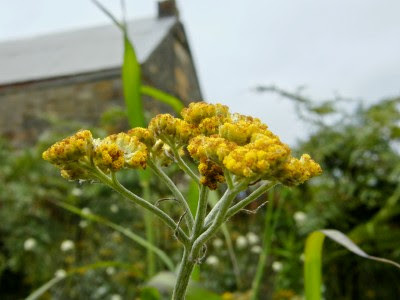 It seems that they literally live on the plants and feed on sap in twigs which causes wilting. Their eggs are also laid on stems of plants. When threatened they produce a foul-smelling secretion as a defence. The rest of the info just stated the obvious like that they are brown in colour and have spiky bits and so on and so forth. After reading the info I was just glad that he tolerated me and didn't secrete any foul sent on me. Today is 88 days to the start of the 2010 FIFA World Cup. About a week or so ago to celebrate 100 days to the World Cup, we had a couple of activities at work. 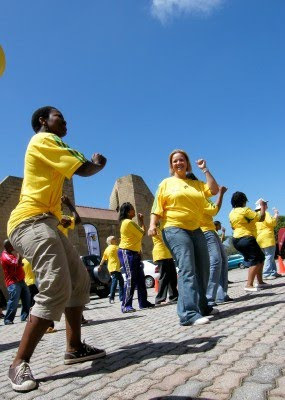 One of the things we did was the Diski Dance. The word Diski is South African township lingo for "soccer". 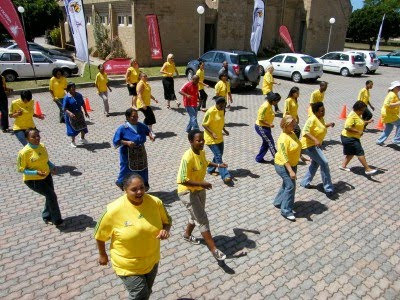 The Diski Dance is a line dance and incorporates soccer moves in its steps. I am sure anybody watching the World Cup on television in June and July will see this dance a couple of times. Today is another Random ... theme day and the theme is Random Country Churches. 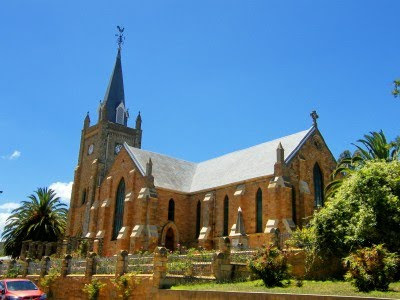 Some of the smallest towns in the middle of nowhere will have magnificent old Dutch Reformed Churches dating back from the early days. In most cases these churches were built in the late 1800's and early 1900's not to only service the town, but also the surrounding farming community. This means that some of these small towns today have huge churches. 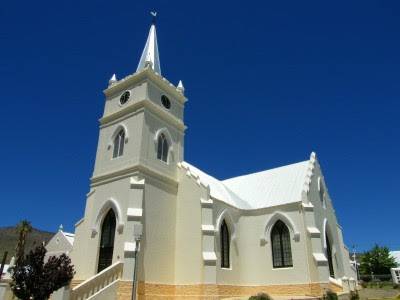 The Dutch Reformed Church in the Karoo town of Prince Albert. I'm not sure when this church was built, but the first church was built in 1844. Driving back from Port Alfred the other day, I did a quick detour to visit a monument that I haven't seen in years. 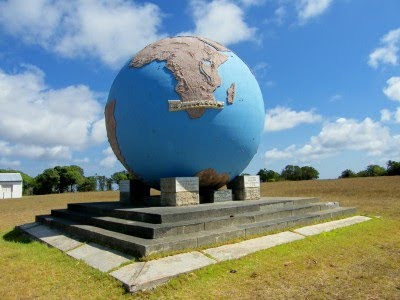 The Karel Landman Monument is situated just about halfway between Port Elizabeth and Port Alfred, just a couple of kilometers up a very good dirt road. 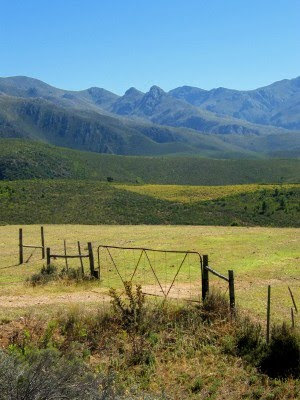 In 1837/8, people of Dutch decent, referred to as the Boers, decided to move away from British rule and trek northwards. In doing this they founded the old Transvaal and the Free State as part of the Great Trek. 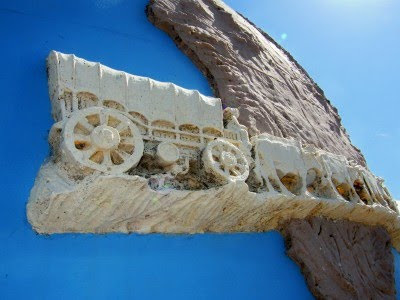 This monument was erected in 1938 (during the centenary celebrations of the Great Trek) honouring Karel Landman who farmed in this area until 1837. He became a leader in the Great Trek and took a party of about 180 trekkers and their servants on a trek of 885 kilometres into Natal. Landman became prominent in several battles with the Zulus and was the second in command of the Boer forces at the pivotal battle of Blood River. 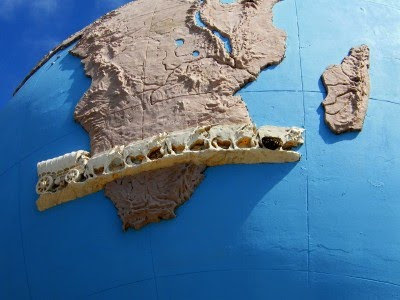 The monument is in the shape of a 3m globe with an ox wagon traversing the it and is situated prominently on a hill overlooking the surrounding countryside. 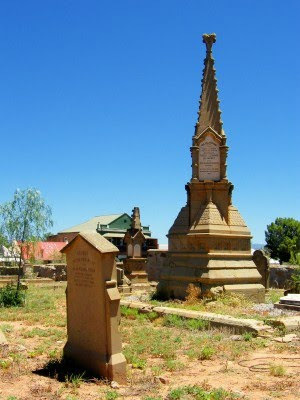 The monument was an initiative of the then National Party and the councils of the Dutch Reformed Church in two neighbouring villages, Alexandria and Patterson. 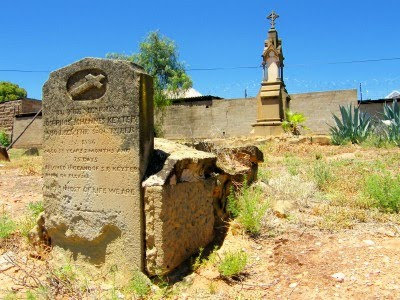 Story has it that the councils could not agree which village should 'host' the monument, so it was placed on this remote koppie between the two villages. My favorite magazine is Weg, South Africa's biggest travel magazine. I had a huge surprise a month or two ago when the deputy editor of Weg's sister publication go! (the English version), e-mailed me asking for permission to use a picture of the Apple Express she had seen on Port Elizabeth Daily Photo. I have said before that when I go professional one day I would love to have my photos (and perhaps articles) published in these magazines, so it was a huge honour to be asked. 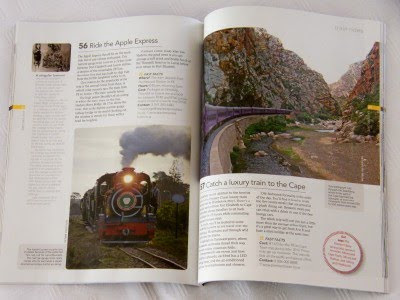 My photo of the Apple Express features in the go! 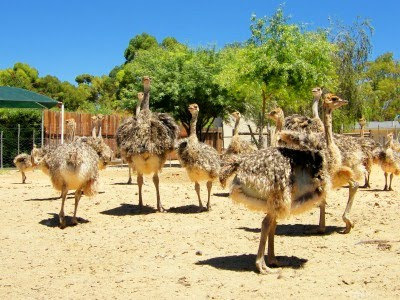 South Africa Travel Guide - 101 great things to do. 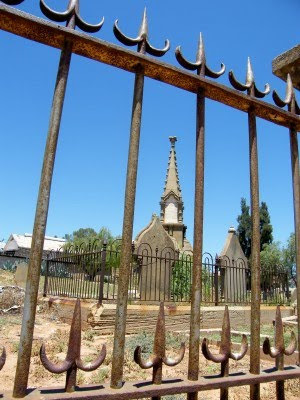 I was driving around the Klein Karoo town of Oudtshoorn looking for something interesting to photograph when I came across this old cemetery. It was surrounded by businesses and a couple of houses with a stone wall and old steel gate in the front. Cemeteries, especially old historic ones, fascinate me, so this was a huge find. The graves were made mostly of sandstone and the majority were so weathered and eroded that you couldn't see what was on them. I did find some with legible writing on them. This one belongs to Josephus Johannes Keyter who died on 8 October 1856 at the age of 38 years, 2 months and 25 days. Close to the gate was this monument which looked like a spire. 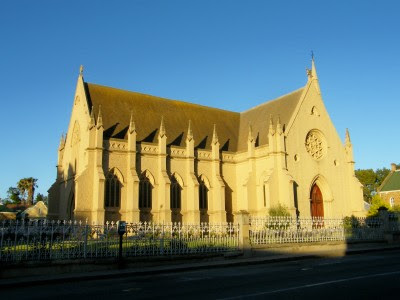 It seemed like it was erected in the latter part of the 1800's as well and was done so by a church for its ministers after they respective deaths. 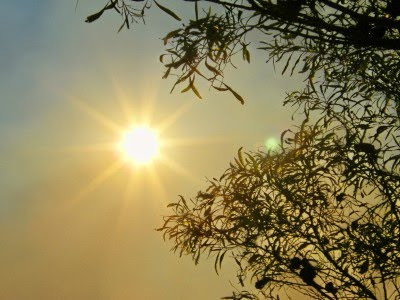 With the recent fires around Port Elizabeth there were quite a lot of smoke around (Duh! 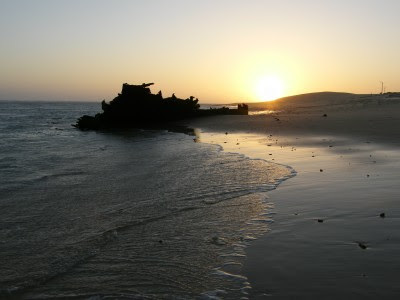 ), which meant nice sunsets and sun shots. For more excellent shots featuring the sky, visit Skywatch. During the recent fires around Port Elizabeth I headed over to Fairview to get some fire shots. I came across this very interesting sight. 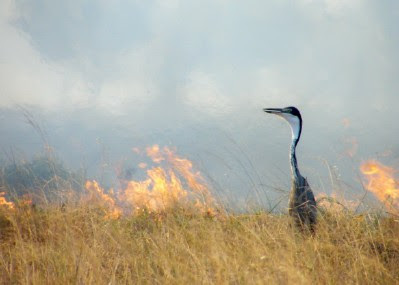 This black headed heron (one of three I could see) was patrolling all along the fire line. There were literally hundreds of grasshoppers and other insects fleeing from the fire and quite clearly the gang of herons caught on to this and became opportunistic hunters. They didn't have to search for the food, the food came to them. 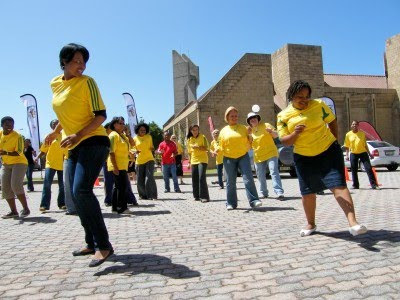 In 100 days time the world will descend on South Africa for the 2010 FIFA World Cup. The opening game takes place at Soccer City on 11 June 2010 while the first game in Port Elizabeth is on 12 June between Korea Republic and Greece. Other first round games in PE will be Côte d'Ivore vs Portugal, Germany vs Serbia, Chile vs Switzerland and Slovenia vs England. All 5 of these games plus a round of 16 game, a quarter final and the 3rd/4th playoff will be played at the new Nelson Mandela Bay Stadium here in Port Elizabeth. The Nelson Mandela Bay Stadium next to the North End Lake is a 45,000 seat multi purpose stadium (48,000 during the World Cup) purpose built for the 2010 FIFA World Cup. The five-tier, 1.1 billion Rand (approximately $150m) stadium is one of three coastal stadiums built in anticipation of the World Cup. This is the first world-class soccer stadium to be built in the Eastern Cape and the first one in the world to be completed in less than two years. The stadium has already hosted a number of high profile matches with amongst others the British Lions playing in a rugby match against the Southern Kings, South Africa playing a soccer international friendly against Japan and Korea Republic playing a practise match against local club Bay United. After the World Cup the stadium may be used as the home ground for the Eastern Province rugby team, the Southern Kings if they are admitted to the Super 15 rugby tournament, as well as Bay United if they return to the Premier Soccer League. The stadium is a magnificent sight, specially at night with its lights on and has truly become a new landmark on the Port Elizabeth skyline. 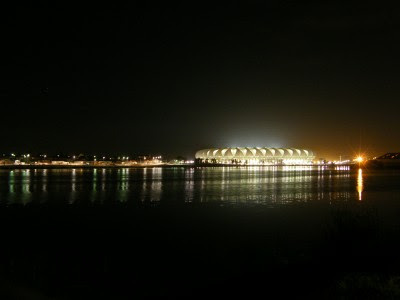 For another night pic of the stadium, visit Port Elizabeth Daily Photo. 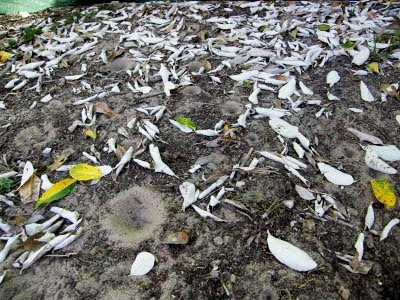 On our recent holiday there were lots of antlion "craters" next to our tent which caught my fancy. If it wasn't for all the leaves in the pic, it probably would have looked like a shot of the moon. Every morning I would plonk myself down next to the biggest one, take aim with my camera and start catching ants to feed it with and trying to coax it to come out. It wasn't that I intended to torture ants, but it was all in the name of the science of photography. I do think its missing me now cause he got to gorge himself on ants every day. Unfortunately I didn't get a shot of him. I could probably have gone digging for him with a twig, but I didn't want to destroy his cone shaped nest. 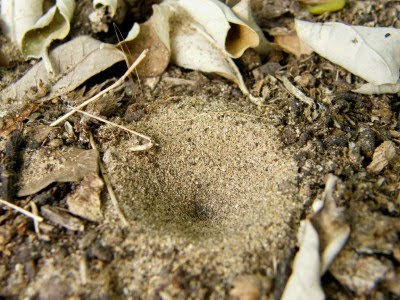 Joan did do a post on antlions a couple of days ago, so if you are curious to see what lives at the bottom of these craters, visit her post here.